Sonic is a Hamburgers, Hot Dogs, and Fastfood Burger restaurant where most Menuism users came for a meal on the go and paid less than $10. 1 review of Sonic, first by minkgirl. The Sonic chain is one of my favorite burgers, except for the fact that they don’t really sell burgers, only cheeseburgers. I have them leave the cheese off and get a burger. I get the tater tots in lieu of fries and a soft drink. I am also partial to their hot fudge sundaes. This location, like most of the others has carhops, usually teenagers. The kids are always nice. The last one was a boy from England who was very sweet. This location is near one of the shopping centers I visit, so although it is not my hometown Sonic, it is a location I frequently pass and sometimes stop at. My daughter likes the chili dogs. I would go here again. Sonic is located near the cities of Lakewood Village. 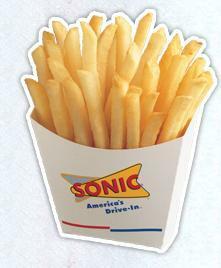 People found this by searching for: Sonic Restaurant Little Elm, Sonic Fm 423 Frisco, Sonic Fm423, Sonic 423 And Main Reviews, Little Elm 423 Sonic, Sonic Little Elm 423, and 423sonic Menu.